Meal delivery has been a pretty popular thing for quite a few years now, if not decades. However, there are hundreds of meal delivery services across the country and it’s quite hard to choose the right one. They all have their advantages and shortcomings, so it all comes down to what you’re looking for and what you’re expecting from a top-class delivery service. In case you’re struggling to make a decision, take a moment and check this ultimate comparison out. We’ve made a comprehensive guide so that you don’t have to go through all the hassles of researching every company individually. Which one of these two suits your requirements better? There’s only one way to find out. When it comes to pricing, home chef is probably one of the most affordable solutions one can choose. They offer a wide array of meals for only $9.95 per serving. It’s important to remember that they charge a $10 delivery fee for orders that cost less than $45. In summary, most restaurants charge at least $12 for a meal meaning you can save a few bucks by ordering delivery. It’s quite a money-saver in the long run, especially if you have a partner, children, or siblings living in your household. As far as the quality goes, it’s definitely by far better than the meals or ingredients you would find in a supermarket. The biggest difference between this and the aforementioned company is the fact that Blue Apron doesn’t charge a delivery fee. In other words, no matter how many meals or servings you order, the delivery is always free. On top of that, it’s important to point out that there are no hidden membership fees – you get what you paid for. Their 2-person plan includes three recipes per week (two servings each) for $59.94. This sum translates to $9.99 per serving. As you can tell, their prices are quite similar to Home Chef’s. 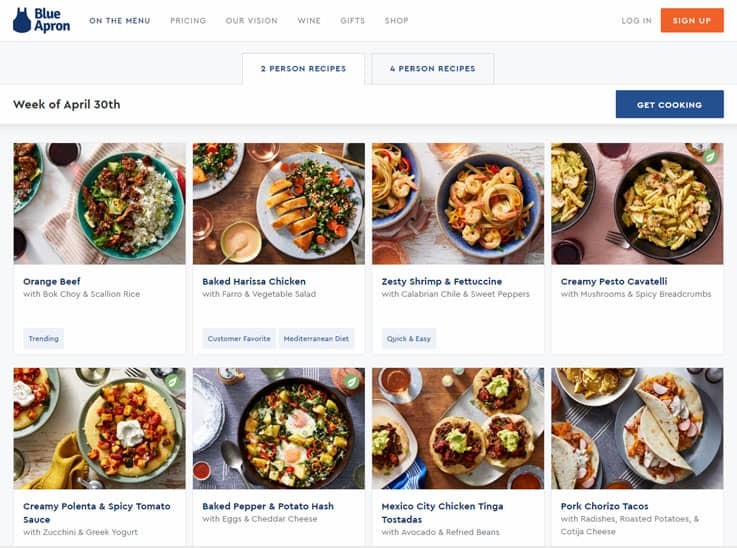 On the other hand, blue apron offers a “Family Plan” which costs $8.99 per serving with 2-4 recipes per week (four servings each). In other words, the minimum you have to pay for the Family Plan is $71.92. It’s evident that this particular plan is slightly cheaper than the 2-person one, but it’s a worthy investment only if you have more than two people in your household. On the other hand, if you don’t care too much about money, it’s up to you to choose between these two plans and find the one that suits your requirements the most. Once you sign up for Home Chef services, they will ask you a couple of questions about your preferred foods, so that they can determine which one of their meals suits your taste. Of course, you don’t have to participate in this survey if you don’t feel it’s necessary. Instead, you can just opt for any of the items found on their menu. 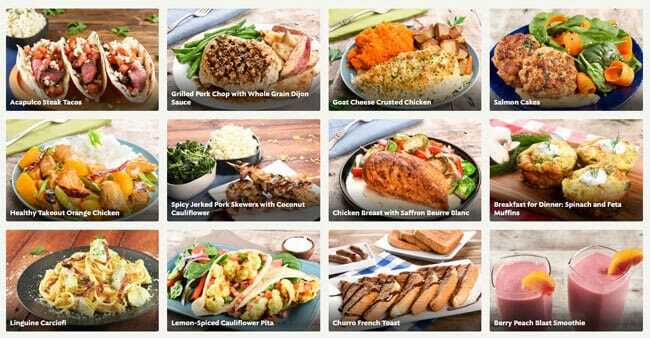 Some people have an issue with the fact that Home Chef offers only ten meals each week, but we find this to be sufficient as there is something for everyone. They include a vast variety of both meats and vegetables for every user to choose from, according to their own taste. On the other hand, if health is a concern, you might want to double-check their offers as there are some with high sodium values which can be detrimental to people with health issues. This company allows you to schedule meals in advance. On top of that, you can change the delivery dates, add/remove meals, or even skip a whole week. As we mentioned, they charge $10 for delivery in case your order is less than $45. 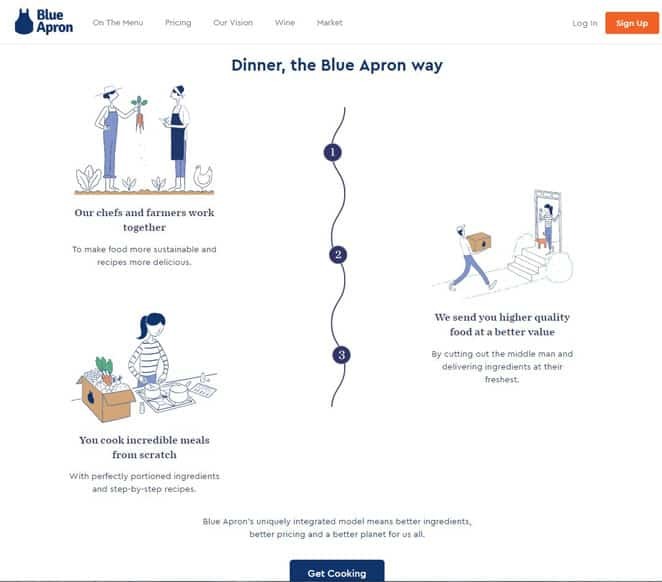 Blue Apron operates on a similar concept as Home Chef, but there are some slight differences. Upon creating an account, the website will point you to your profile in order for you to get familiar with the advantages of the service. In there, you can change whatever you want including delivery info and dietary preferences. It’s a pretty important step in the whole registering process, especially if you have specific needs. Once you’re done with setting the account up, refer to the “Upcoming” tab to see the planned deliveries. And…that’s it! All you have to do now is wait for the ingredients to show up at your door so that you can start cooking! In case you stumble upon any issues during or after registration, don’t hesitate to write a support ticket or contact the Help Center as they are quite responsive and willing to help 24/7. They also offer additional choices such as Fruit Baskets and Smoothies (requires a blender). These are just a few choices you can make out of dozens if not hundreds of recipes. In case you’re interested in exploring more, visit their Cookbook page and you’ll be amazed by the number of possible combinations. Both of these companies operate at a pretty high level. As expected, they have their advantages and shortcomings, but there are no significant disadvantages that might turn you away from any one of these two service providers. As far as we are concerned, Blue Apron has a slightly better offer on the menu, but that’s also a matter of personal preferences. In other words, there is really no “better one” in this seemingly complex battle, but instead, it all comes down to what kind of foods you prefer more. As far as the pricing goes – it’s more than acceptable. Both Blue Apron and Home Chef offer affordable solutions in case you’re struggling with budget issues. There are a few ways to save a bit of money in the long run, for example, by choosing a Family Pack over the 2-person plan. However, that’s usually favorable for households that have four or more residents. In the end, the results are tied. Both services are great and the only major thing that separates them from each other is the food choice. That’s why we recommend checking both of them and seeing which one offers meals that suit your taste and preferences.